This graphical novel really resonated with me because I got to see Superman vulnerable and human which is something that you rarely get to see especially like this. 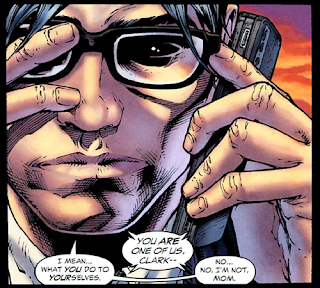 Clark continues to be relatable but in a completely different way when he realizes what it truly is like to be like us. 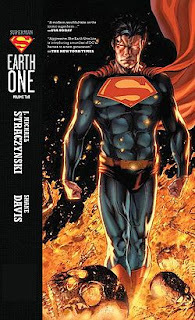 Parasite is the main villain in this book. His image is very different and quite jarring in comparison to how he has been depicted in the past. He is rather creepy and terrifying in this story. It's his origin story that really send the chill down your spine seeing what he did and how awful of a person he always has been. It's one thing to become corrupted by power but to already be corrupted and then gain power is a whole different story. We also see Clark in the suit a lot more in this book. 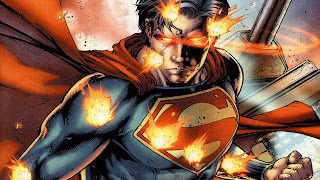 This is where we get to see Superman test his limits, take risks, and decide what kind of man he's going to be. I connected with Clark on so many levels in this novel and one in particular the most. I really feel like this shows the exact experience that humbles him and makes him realize the strength of humankind so much that he decides to make it his life's work to protect us. The art once again blew me away. Shane Davis really knows how to draw those close personal moments as well as the cinematic epic ones. As far as I'm considered there's no better follow ip story like this or one that shows why Clark has such care and sympathy for humankind.